SOURCE GUARDIAN DAILY MAIL: Has Cameron just admitted Austerity is a cover for permanent cuts? 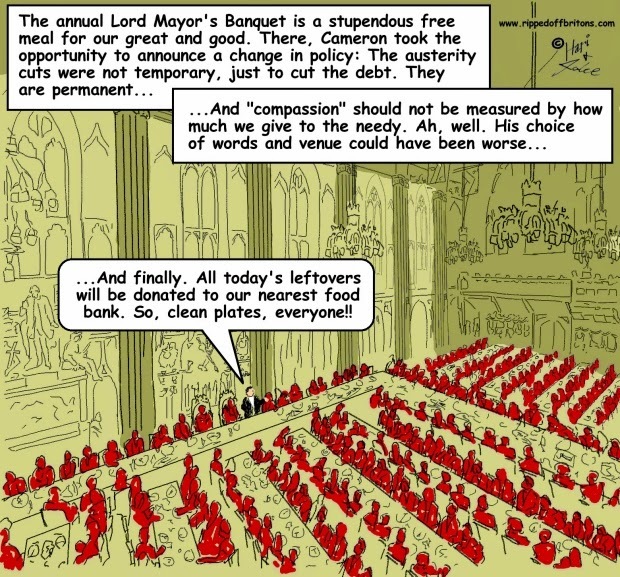 David Cameron said, in his speech at the Lord Mayor's Banquet, that the government is to forge a "leaner, more efficient state" on a permanent basis. He signalled he had no intention of resuming spending once the structural deficit has been eliminated. This is a clear change to claims made after the last general election. In his New Year's message issued on 31 December 2010, he said: "I didn't come into politics to make cuts. Neither did Nick Clegg. But in the end politics is about national interest, not personal political agendas. We're tackling the deficit because we have to – not out of some ideological zeal. This is a government led by people with a practical desire to sort out this country's problems, not by ideology." Hahahahaha, I´m laughing my head off, exactly the same arguments in Spain, Greece, Portugal... obviously here in the south the situation (30% extreme poverty rates, 100.000 evictions per year etc) is probably much worst, but, there you are! Thanks for keeping us informed here in the land of corruption! He's a Tory. They don't do telling the truth, keeping promises, thinking before boasting about the policy idea they dreamed up while drunk, or anything sensible, decent or honest. Our Prime Minister and his cronies are gradually being outed as their pretense to being a "caring, sharing" party falls apart. They are returning to the old Tory self-centred, self-helping, grabbing b'stards that they always were under the thin veneer they were cloaked in to fool the electorate into putting them (nearly - they had to con the dozy Lib-dems into helping) into government to wreak havoc on the general population of this country. THEY'VE BEEN OUTED AND IT'S TIME THEY WERE OUT OF POWER IN WESTMINSTER.